Lories and Lorikeets can be found throughout the islands of the South Pacific and Australia. Nearly all of these birds have been impacted to varying degrees by habitat destruction due to logging and conversion for agricultural purposes; as well as capturing of the nestlings and adults for the exotic pet trade. Tails: Species with longer tapering tails are generally referred to as "lorikeets" and those with short, rounded or square tails as "lories." Size: Lories tend to be bigger in size than lorikeets. 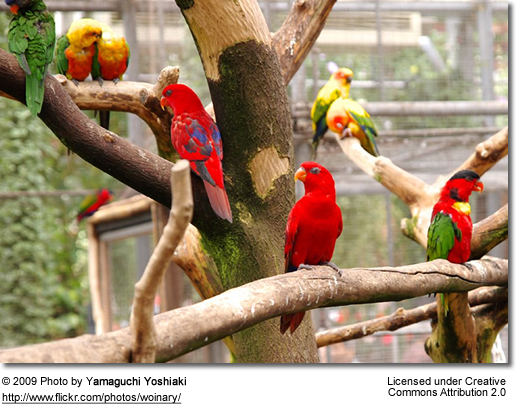 Plumage: Most lories are red with patches of yellow, purple, and green. Most lorikeets are green with patches of red and yellow. There are some exceptions to this rule. They are also known as honeyeaters or "brush-tongued" parrots. The latter nickname relates to their very specialized tongues with tiny hair-like structures ( 'papillae') at the end in the shape of an "U". As these birds extend their tongues to feed, the papillae stand on end - like bristles on a brush - soaking up nectar and pollen of any flowers or scraping the inside of fruits to collect the sweet juices. These parrots have been observed feeding on over 600 flowers over one day. They are very important for the pollination of many species of tropical plants, which might perish without these "services". The shape of their beaks also differ from those of other parrots. Their upper bill has a long, pointed tip and is much narrower structure than that of other parrots, allowing them to easily extract hard-to-reach seeds from cones and other vegetation. Their very specific dietary requirements sets them apart from other parrot species. Their mostly "liquid" diet makes them messy to keep in homes unless accommodations have been put into place to allow for easy clean-up. In the wild, they mostly feed on nectar, flowers, fruits, pollen and seeds. 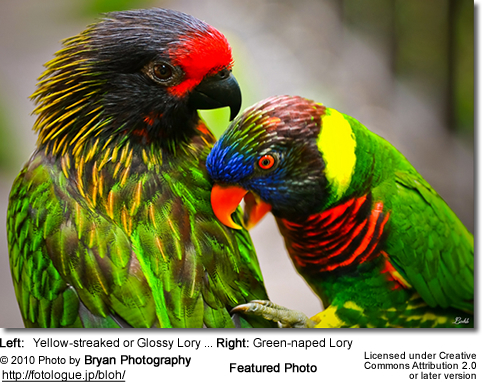 Lories and lorikeets usually stay with one partner and may breed at any time of year. Though in southern Australia the breeding season is between August and January. Nest sites are high above the ground in the hollows of trees, which the birds layer with a covering of decayed wood. The female and male will often roost together, but only the female will sit on her two small white eggs. However, the male will help feed the chicks, which hatch with eyes closed and no feathers. The chicks will slowly grow plumage and be able to fly after seven to eight weeks.